Granted it was more prevalent before drug laws became more strict throughout the world, and many times it was with musicians now hailed as the greatest to ever perform. Such is the case with Chet Baker, the subject of Robert Budreau's Born to Be Blue. Baker was one of the biggest names in jazz but like his musical contemporaries, he couldn't resist the vices that came with fame. 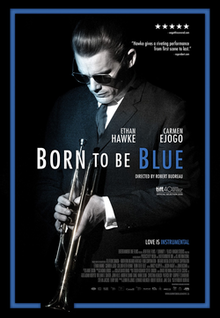 Being part fictional/part factual, Born to be Blue focuses on Baker (Ethan Hawke) as he tries to go straight. With the help of girlfriend Jane Azuka (a composite of several women in Baker's life played by Carmen Ejogo), he tries to maintain steady work as well as staying clean. But will Baker give into temptation? Born to Be Blue admittedly follows the familiar formula for biopics though Budreau does coax out some solid work from Hawke. The actor, who's had his fair share of hits and misses over the years, shows the strength in his abilities. Hopefully awards voters will remember it by year's end. All in all however, Born to Be Blue is average at best. It does try its best to achieve the same ranks as Walk the Line but it falls short. Still, Hawke's performance makes up for it in the long run. John Ford is the undisputed great when it comes to westerns. His collaborations with John Wayne are the ones that have stood the test of time. Sure, there have been the likes of Sergio Leone and Clint Eastwood in the years to come, but Ford is frequently the first name that comes to mind when westerns are concerned. My Darling Clementine sometimes isn't held in the same regard as Stagecoach or The Searchers. (Probably because it doesn't star Wayne.) Perhaps it's because the film's easily the most human of the entire western genre, a trait seldom applied to others. 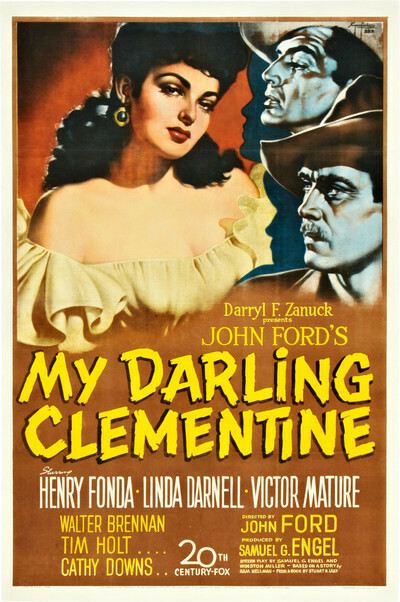 Being the first post-war production for both Ford and star Henry Fonda, My Darling Clementine also displays a sense of maturity frequently found in works from this time in Hollywood. Both established and emerging names were coming home from the war, and they wanted the movies they worked on to be real. It doesn't take much to see that My Darling Clementine is another of Ford's many great films. Gorgeously shot by Joseph MacDonald, it's the kind of picture you need to see at least once in your lifetime. 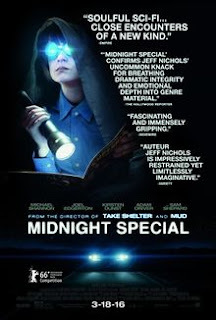 Much like Nichols' previous feature Mud, Midnight Special is set within the backroads of America, itself a character in its own right. And like Take Shelter (another Nichols title), it has Michael Shannon encountering things of an otherworldly nature. Nut again there's more to the film. In a way, Midnight Special could be viewed as a metaphor for raising an autistic child. You have to protect that child with caution, making sure their surroundings don't harm them in any way. Now you may not see the film in this light but others might. But overall, Midnight Special is lacking compared to the one-two punch of Take Shelter and Mud. The majority of its heft is in the second third and even then it doesn't feel like much. Hopefully Nichols' next film will be a touch better. What motivates us from going through a certain action? Is it our conscience that stops us? The lingering sense of guilt that follows in the aftermath? Whatever the reason, it's within human nature to have second thoughts before following through. Gavin Hood's Eye in the Sky has this as its main theme. Revolving around drone warfare (hence the title), it focuses on the tough decisions one faces when at war. Is the effect of one action worth it as a result? Similar to The Ox-Bow Incident decades earlier, Eye in the Sky lingers on the characters' consciences before and after their actions. Some view what they're doing as simply doing the right thing while others acknowledge that innocent lives are at stake. What matters is if their gut instincts are the right ones. As is frequently the case for war-themed films, the cast of Eye in the Sky is solid. Featuring the likes of Helen Mirren, Aaron Paul, the recently departed Alan Rickman, and Barkhad Abdi, Hood ensures that this quartet of actors delivers. And boy, they do. 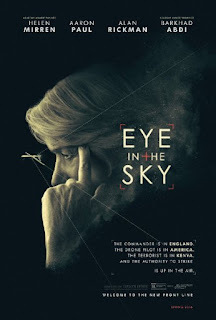 Eye in the Sky is a very solid film though it does start to lose steam towards the end. Regardless of that detail, Hood does make a thoroughly effective thriller, the kind reminiscent of those from the Cold War era. In other words, it's worth a look for those curious. It's established pretty quickly in Norman Taurog's Presenting Lily Mars that the titular leading lady (Judy Garland) so wants to become an actress. Her persistence is so strong, she starts annoying director John Thornway (Van Helfin) to give her a chance. But will she succeed? And of course with this being a Metro-Goldwyn-Mayer Studios production, Presenting Lily Mars relies a bit more on the musical numbers than, well, anything else. (Hey, a little escapism doesn't hurt every now and again.) Though when the film does decide to focus on the plot, it's either hit or miss. However, there is some good comedy within certain moments of Presenting Lily Mars. Both Helfin and Richard Carlson dish out their fair share of reaction shots. (Marta Eggerth meanwhile has a glare that could cut clean through you.) And Garland gets in on the comedy as well. 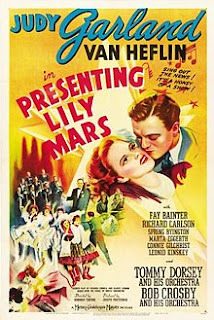 All in all though, Presenting Lily Mars isn't anything too remarkable. Yes, the actors have good chemistry but once you read the plotline, you can tell what path it'll be going down. It does provide some entertainment but not much. Actors tend to make for fascinating subjects in fiction. Their fears, their insecurities, all of those are on display for their unseen audience. What flaws of their do they keep hidden from the public eye? Now Othello plays a major role throughout A Double Life but that's not the only Shakespeare work that gets an allusion. At one point in the film, an element pulled straight from Hamlet is featured. To say what it is would give away other details of A Double Life. 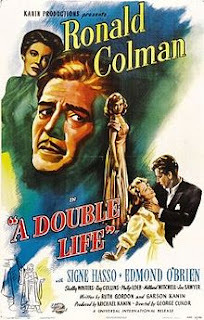 A Double Life is definitely lesser-known Cukor though considering Colman won an Oscar for this (and rightly so), it deserves a look at least. Being released in a year of prominent titles like Black Narcissus and Odd Man Out, it's perhaps understandable that it's somewhat forgotten. Again, it deserves at least a look. 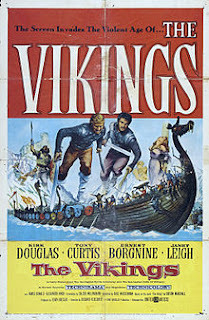 If there's one thing that 1950s Hollywood churned out more than flashy musicals, it's adventure-filled epics. The quality doesn't generally matter for this particular genre. All that matters is that it's entertaining and it has a star-studded cast. Richard Fleischer's The Vikings certainly fulfills those two details but what else does it provide? Admittedly not much else but hey, it was released the same year as Vertigo and Cat on a Hot Tin Roof. It had to find a way to stand out somehow. Politics and Hollywood make for strange bedfellows, especially back in its Golden Age. After all, one's political beliefs could damage their hard-earned work. (The prime example being the Hollywood Ten.) That's one detail stays persistent over the years; the power of a political party has a certain control on one person. 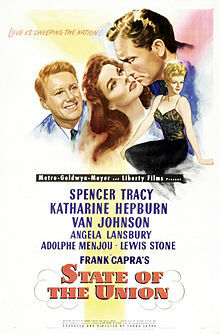 As if often the case with films of a political nature, State of the Union has a consistently solid cast. This being their fifth collaboration, Tracy and Hepburn have good chemistry even though she doesn't have terribly much to do. Van Johnson and Adolphe Menjou provide some quick one-liners, Johnson especially. But it's Lansbury that easily steals the show. State of the Union began to show that Capra was starting to lose his former abilities as a director. 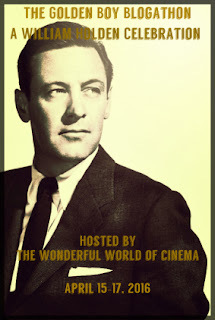 Yes, he made It's a Wonderful Life only two years prior but bear in mind Hollywood was changing then. Not many people in Hollywood thrived for very long. Lloyd Bacon's Picture Snatcher opens with Danny Kean (James Cagney) getting released from prison after a three-year stint. But upon getting that whiff of freedom, he decides to go straight. He gets a job at a tabloid and quickly makes a name for himself as a photographer. This being a title made in the pre-Code era, one of the plot points of Picture Snatcher involves Danny taking a picture of an execution the moment the switch is thrown. This is a reference to an event just five years prior. As Ruth Snyder was strapped into the electric chair, Tom Howard prepped the hidden camera on his person for the second electricity started coursing through her body. The result was perhaps one of the most sensational photographs taken. Back to Picture Snatcher. It was made between 42nd Street and Footlight Parade (also starring Cagney), two of Bacon's more well-known films. Is it because of this detail that made Picture Snatcher somewhat forgotten? Perhaps though considering its star, it's hard to see why that is. The reason? Why, it's Cagney, that's why. This is a performer that very rarely doesn't deliver when it comes to his work. Whether it's a leading role from the height of his career or something towards the end of it, he knew how to entertain his audiences. 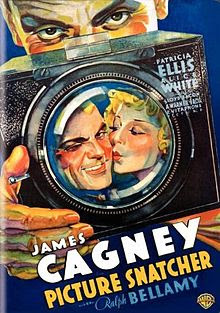 Picture Snatcher is certainly one of the more entertaining titles of Cagney's extensive career. (Surely he must've had some fun making this.) It may have gotten lost in the shadows of his more famous films but that doesn't mean it should be entirely ignored. Liz of Now Voyaging and and Kristina of Speakeasy have teamed up for a blogathon to cover (no pun intended) film adaptations. 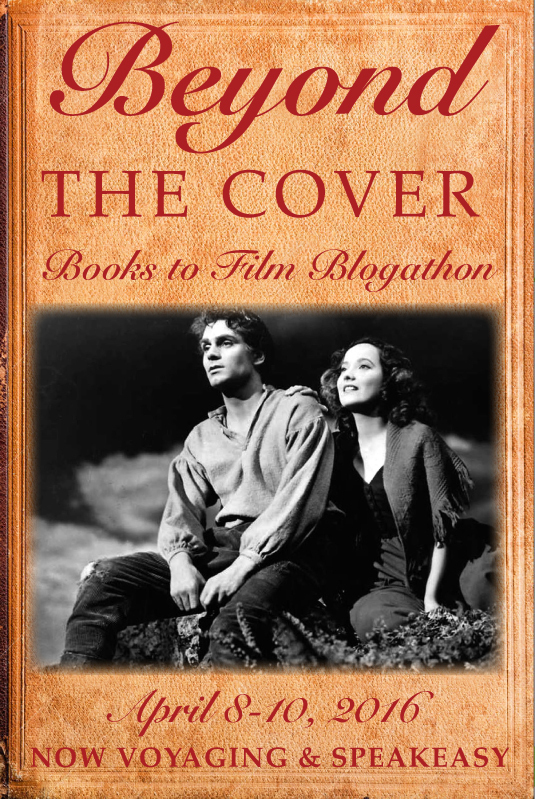 As regular readers know, I frequently compare books and their film counterparts. So I decided to discuss one that I've already covered years ago. The title in question? Wendell of Dell on Movies has given me this award, and I thank him for that. Right, let's get this over with. Nominate other bloggers (up to 11) and give them 11 questions to answer. 1. Name an actor or actress whose films you will always see, no matter what. Tell us why? Usually it depends on which actor I'm mildly obsessing over at the moment. (More often than not, this applies to actors from the British Isles and TV shows come into play more.) But overall, I suppose this applies to the recently departed Philip Seymour Hoffman. He easily stole every scene he was in. 2. Name an actor or actress whose films you try not to see, no matter what. Tell us why? James Franco. He was good in Milk but overall, I try to avoid his incredibly punchable face. 4. Where is your ideal seat in a movie theater? Somewhere in the back row, an aisle seat preferably. 5. Other than in a theater, how do you watch most movies? (Redbox, Netflix, online, Blu-Rays/DVDs you own, etc.) Depends. Sometimes Netflix, sometimes movies I borrow from the local library. But most of the time it's stuff I have on my DVR. 6. Name a movie you love from a genre you hate. Well, it's more along the lines of "genre I don’t regularly watch", but Rio Bravo. 7. Name a movie you hate from a genre you love. Friggin' Crash, man. AMPAS has to do a hell of a lot to make up for that. 8. What classic era director (1960s or earlier) would've made a great superhero movie? Why? Maybe it wouldn't be a great movie but with Buster Keaton at the helm, it would certainly be daring as all hell. Have you seen the stunts he did for his films? They could've killed him easily had he not taken the necessary precautions. Just imagine if he had someone else doing those stunts. 9. What currently working director would've made a great classic era noir? Why? Todd Haynes. If Far from Heaven and Carol are anything to go by (as well as the HBO mini-series adaptation of Mildred Pierce), the man knows how to capture an era that has long since passed. 11. You're going to spend the rest of your life all alone on a deserted island. You're allowed to bring only three movies with you. What are they and why? Singin' in the Rain (because it's an absolute delight), On the Waterfront (because the acting's great in it), and The Godfather Part II (just for something to pass a lot of time). So whom am I giving this award to? Movie you always recommend to others? What’s that one movie that's very nearly perfect in your eyes? Do you read the book before seeing its adaptation? Favorite movie from your birth year? At the theater, on TV or on DVD? What's the most number of movies you’ve seen in a single day? You go back in time to have a little *ahem* "fun" with a celebrity of your choosing. Who is it? Okay, I'm done now. Now shoo. I have other things to tend to. Crystal of In the Good Old Days of Classic Hollywood is at it again with the blogathons, this time with one about birthday girl Bette Davis. With Davis being one of my favorite actresses, I decided to chip in. 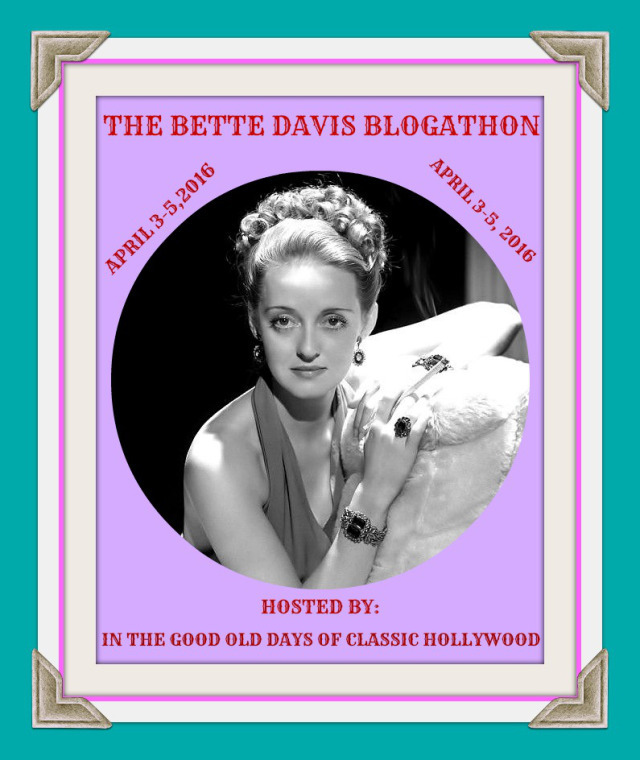 Alas this was one of those blogathons that wouldn't allow duplicates and all the obvious titles were already claimed. Thankfully I noticed there was one Davis film I saw that wasn't claimed by another. The film in question? With W. Somerset Maugham's source novel being one of my favorite books, I was curious about the film. Apart from chopping this epic of a book down to a tidy 83-minute running time, Cromwell does stay true to what Maugham wrote. For some reason there were two other adaptations of the novel. Hey, if it isn’t broken, why try to fix it? 1962 was a damn solid year for film, wasn’t it? Almost makes the 35th Academy Awards basically the award equivalent of Sophie’s Choice. And To Kill a Mockingbird got its fair share of recognition, winning three out of its eight nominations. One of those wins was for Gregory Peck’s immortalizing performance of Atticus Finch and it was richly deserved (as with Horton Foote’s screenplay). Back to the film. To Kill a Mockingbird is definitely one of the rare film adaptations that perhaps exceeds the book it’s based on. (It also contains some of the very few child performances that are actually effective. Thank you, Mary Badham and Philip Alford, for that.) And being made in a time of racial tensions, it makes the film all the more poignant. Now I feel that shot best sums up Atticus’ nature. Even in the face of anger boiling over in small Maycomb County, he maintains a calm demeanor. (In fact, he only loses his composure once during the whole film.) He stands his ground in doing the right thing, even if it means making enemies in the process. When we first see George Dunlap (Albert Finney) in Alan Parker's Shoot the Moon, it's clear that he's overwhelmed by domestic life. He soon gets on the phone with his mistress Sandy (Karen Allen), and he admits to her that he can't stand being without her. And shortly after that, we find out that his marriage to Faith (Diane Keaton) is deeply fractured. 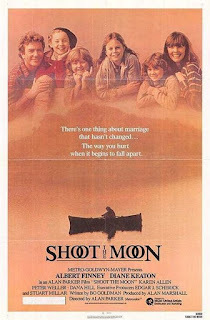 What follows in Shoot the Moon is George and Faith trying to cope in the aftermath of his actions. In a vein similar to Kramer vs. Kramer, Parker captures the struggles of raising a family during a time of separation. But how will this formerly tight-knit family handle the changes? Shoot the Moon doesn't just focus on George and Faith adjusting to the changes in their lives. Their daughters, particularly Sherry (Dana Hill), feel resentment towards George for breaking up their family. But what will be the final fate of the Dunlaps? Sometimes queer directors tend to capture the woes of everyday life better than their straight counterparts. Christopher Isherwood wrote about human behavior more intimately than, say, Ernest Hemingway. Andrew Haigh captured the tumultuous nature of marriage in 45 Years as well as John Cassavetes did in Faces. And those are just a few examples. Ira Sachs' Forty Shades of Blue also focuses on the stormy stages of a relationship, this one of a May-December variety. One half (Rip Torn) is persistently unfaithful while the other half (Dina Korzun) isn't happy with the state of their relationship. But soon something happens that alters the delicate balance of this union. 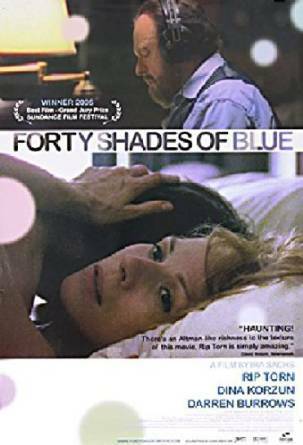 Forty Shades of Blue admittedly follows a familiar formula: strained relationship, third person enters the picture, complications ensue. It's an overused trope by this point but if it's in the right hands, it might result in something original. Alas, that's not the case here. Sachs does provide a perspective that can equate to an outsider looking in. He depicts a relationship quite simply beyond repair, faint glimmers of hope sprinkled here and there. But all in all, Sachs shows there's no chance for these two. Forty Shades of Blue by many means is an average film though Sachs does try his best. But unlike his later film Love Is Strange, Sachs depicts a doomed affair. At least the work from Torn and Korzun is solid enough. The late 50s and early 60s saw the emergence of the British New Wave. It depicted kitchen sink drama, another name for the plights the working-class protagonist encountered. By now it's a movement that has run its course but sometimes it makes its presence known in more recent titles. 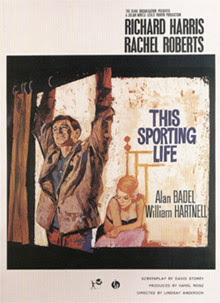 One title from the movement's peak was Lindsay Anderson's This Sporting Life. Like earlier films of the British New Wave such as Saturday Night and Sunday Morning and Room at the Top, it depicts a man who's unsatisfied with his current life and finds brief solace in a woman. But that only adds to his problems. This Sporting Life was Anderson's first feature-film debut after making several documentary shorts. Here, he channels the era's long-simmering anger in the form of Frank Machin (Richard Harris). But this detail also shows the film's age. This Sporting Life may not measure up to other British New Wave titles to some but it does have its moments. The work from Harris and Rachel Roberts is good but again certain elements show the film's age. At least Anderson depicted Britain's anger better five years later.